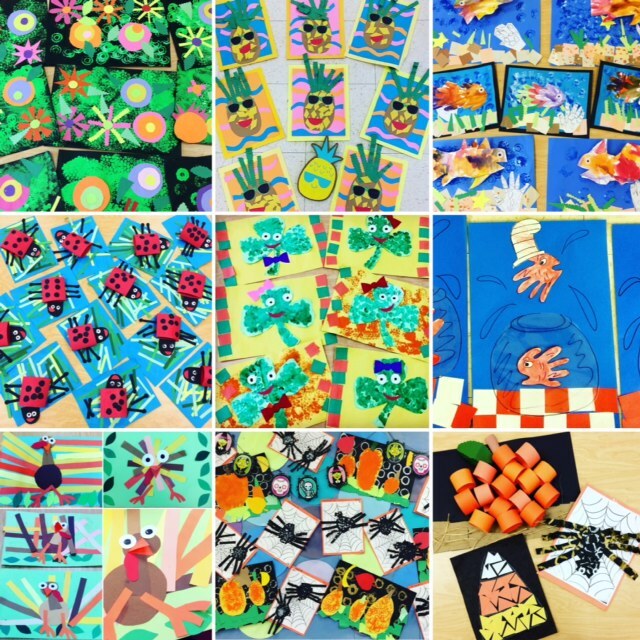 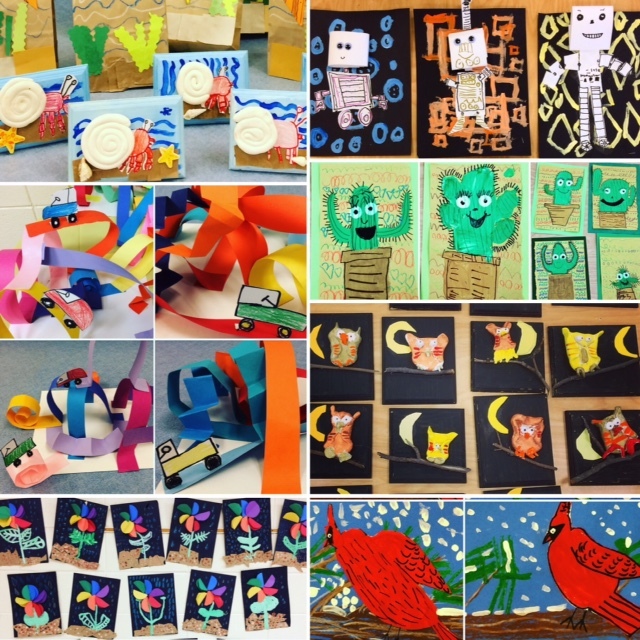 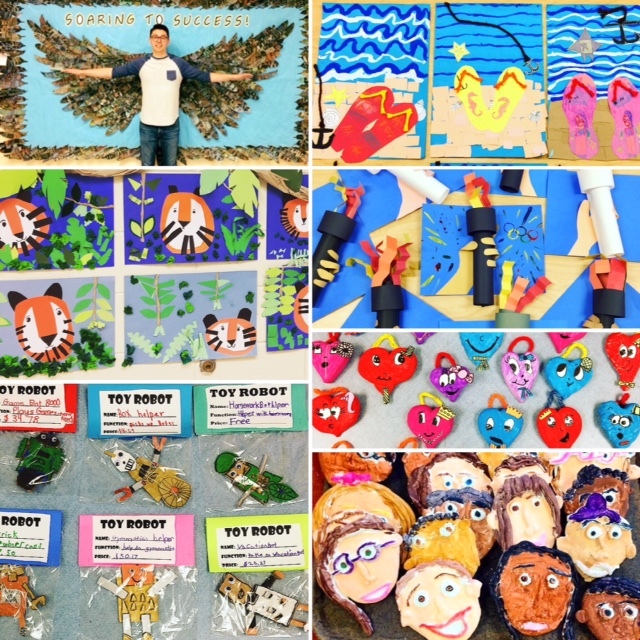 Here are my favorite Kindergarten art projects of the year! 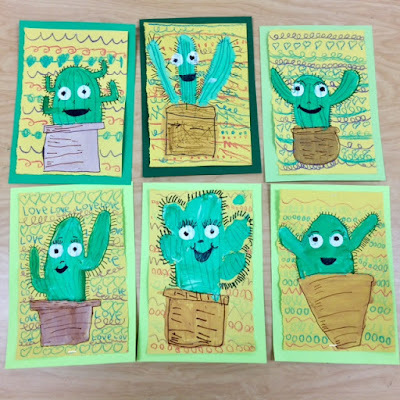 Here are my favorite 1st Grade projects of the school year! 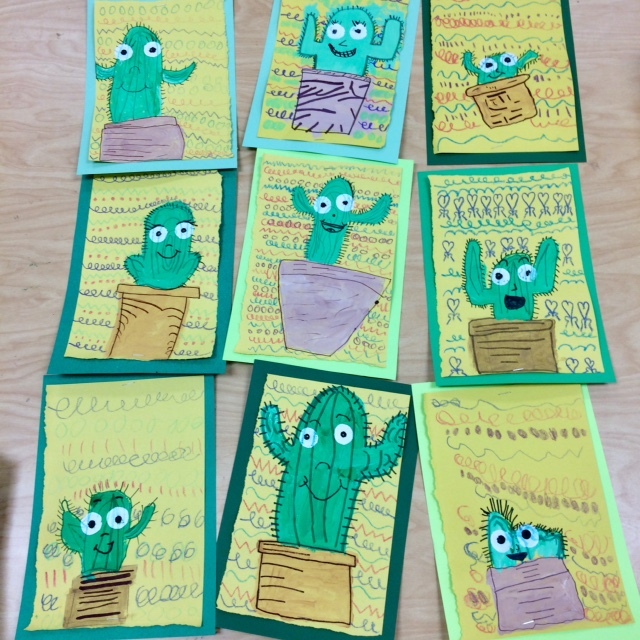 Here are my favorite 2nd Grade projects of the school year! 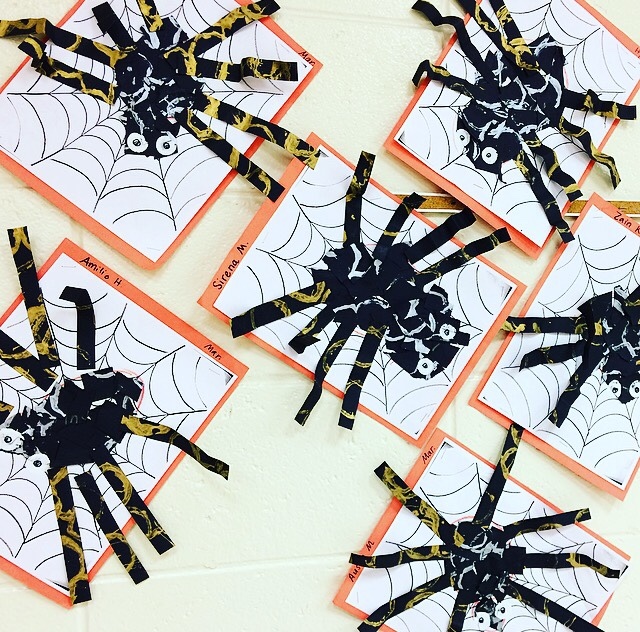 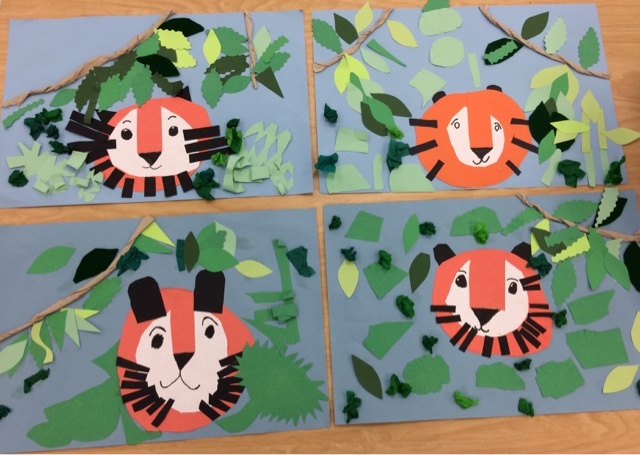 Here are my favorite Small Group PreK projects of the school year! 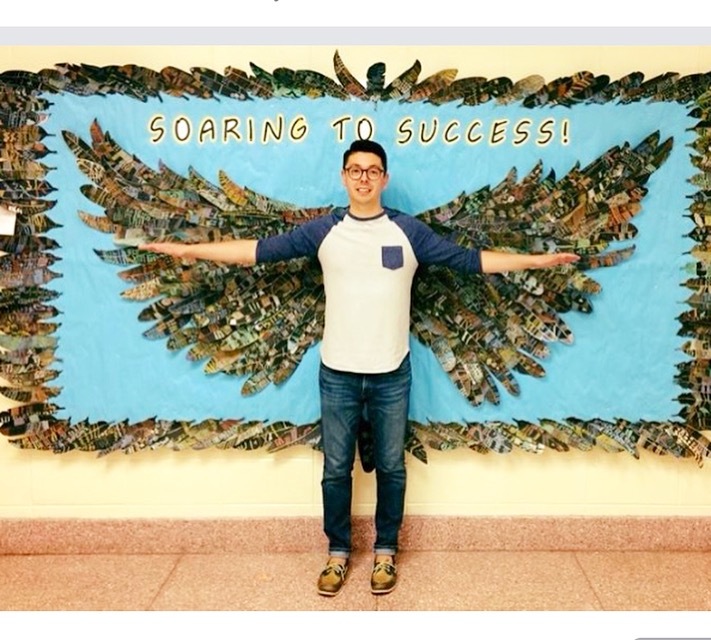 Soaring to Success at Young School! 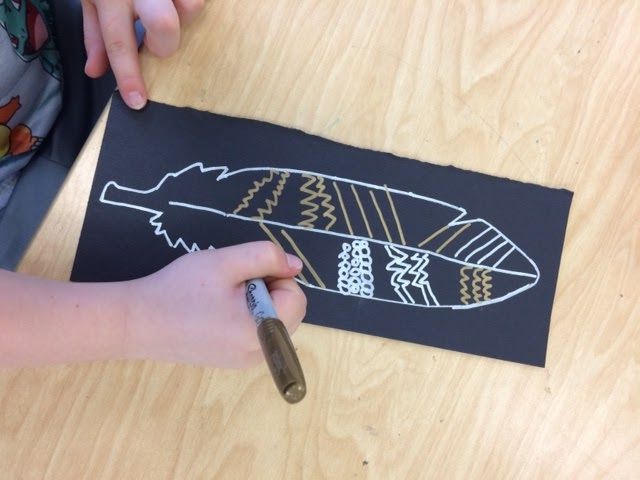 Each 2nd Grade student created a feather and Mr. Giannetto assembled them to create falcon wings. 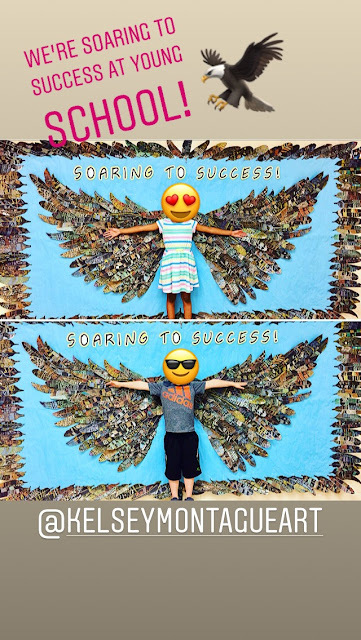 We soared to success at Young School this year and were respectful, kind, and safe! 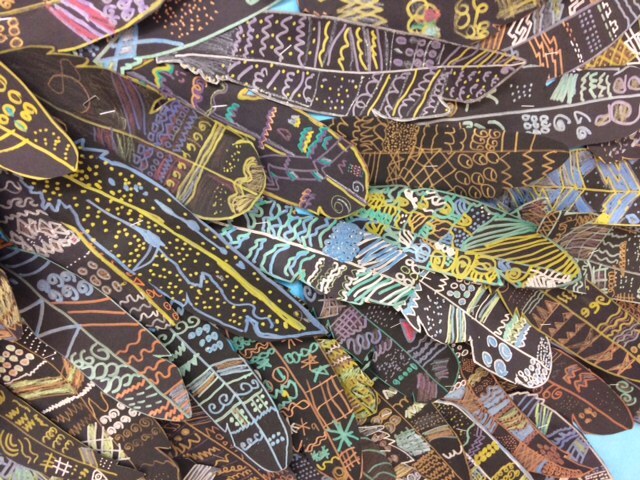 Students and Staff loved this interactive and collaborative art piece! 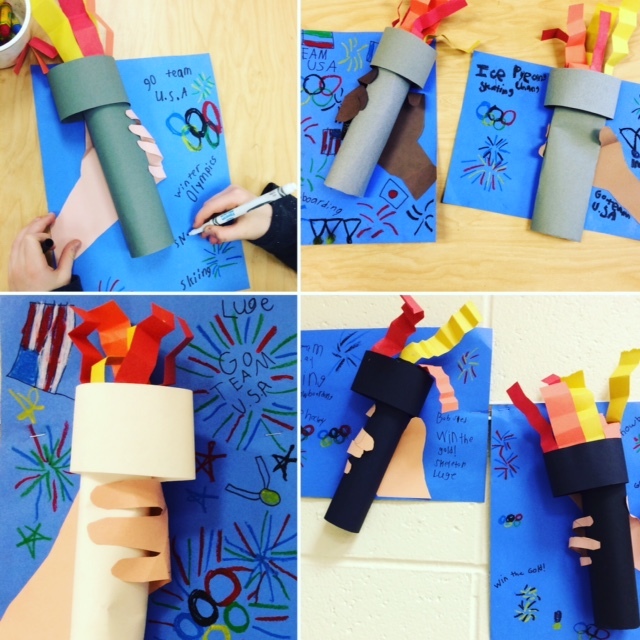 We're proud of Team U.S.A.! To celebrate the Winter Olympic Games in PyeongChang we created paper Olympic torches. 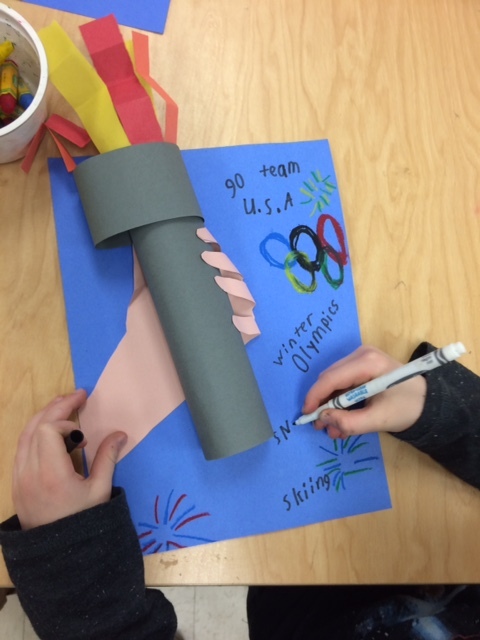 First, we rolled a tube and added a strip of paper at the top to make a torch. 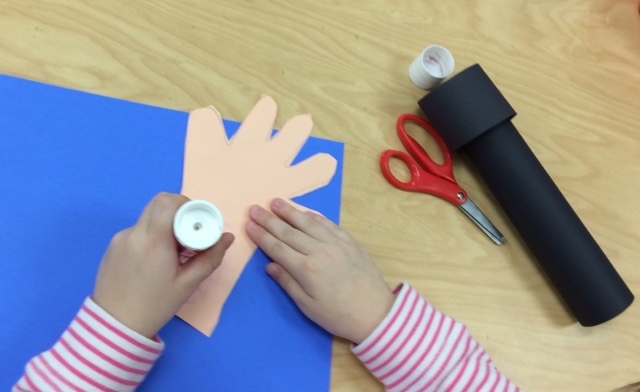 Then, we picked our skin color and traced our hand/arm and cut it out. 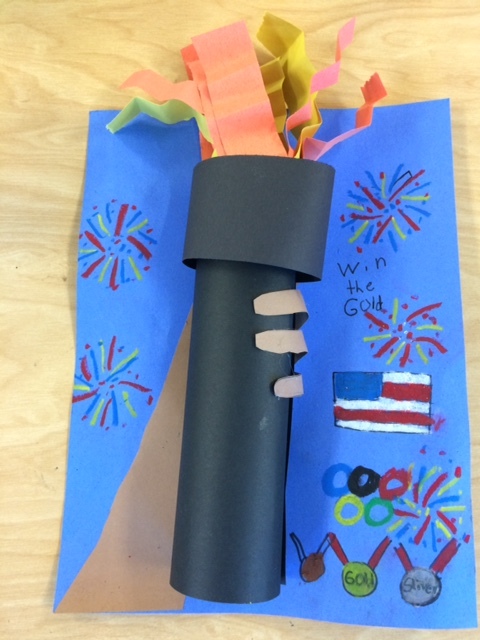 We attached the hand to the blue paper and wrapped our fingers around the tube to hold the torch. 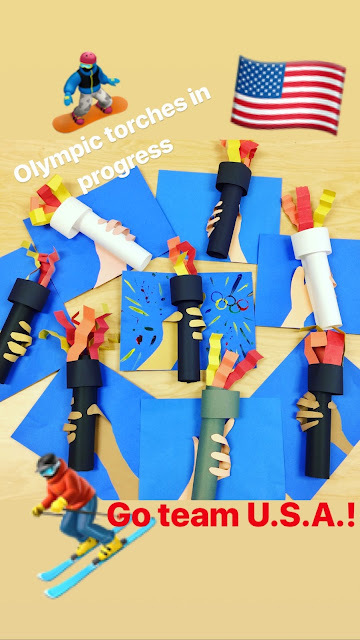 Finally, we added paper strips for flames and decorated the blue paper with words and pictures to represent the Winter Olympics. 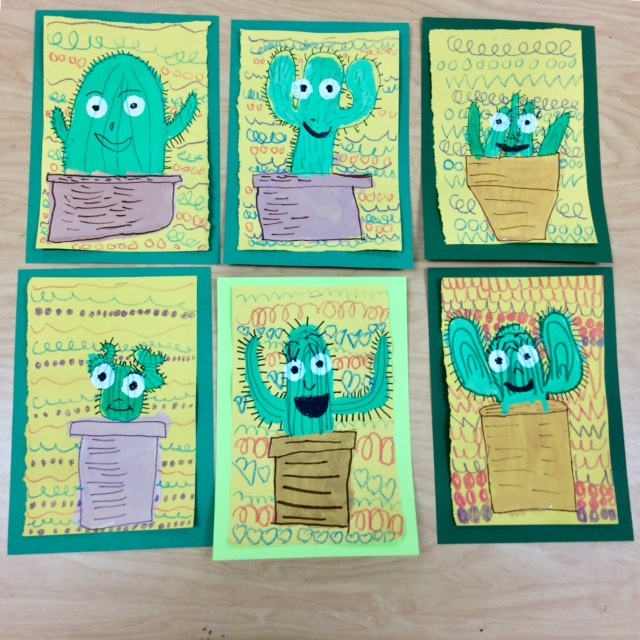 Meet our First Grade Cactus Friends! 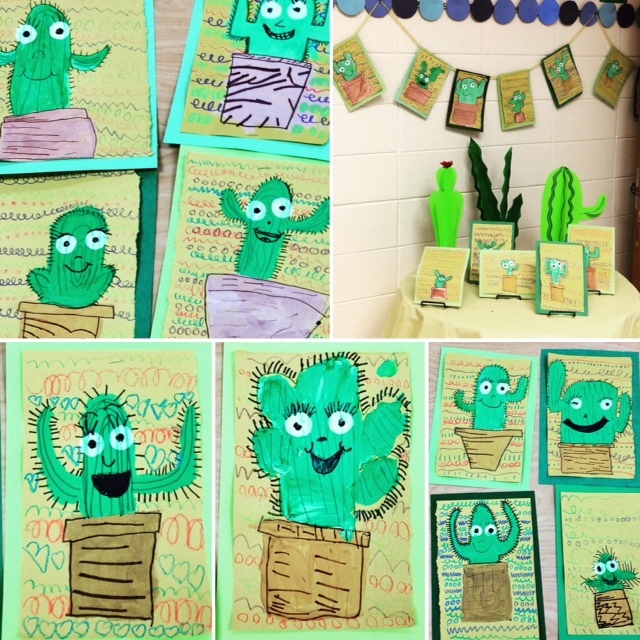 Each friend has his/her own little personality! 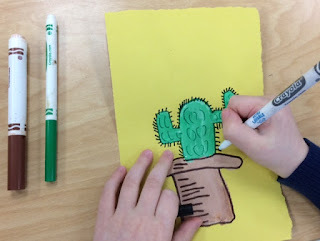 First, we drew the cactus in a pot. 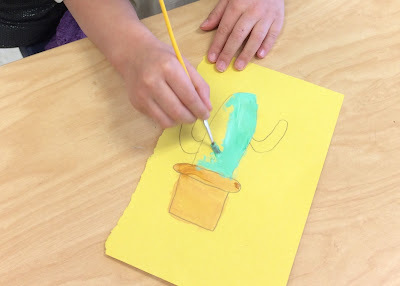 Next, we painted the pot brown and the cactus light green. Then. 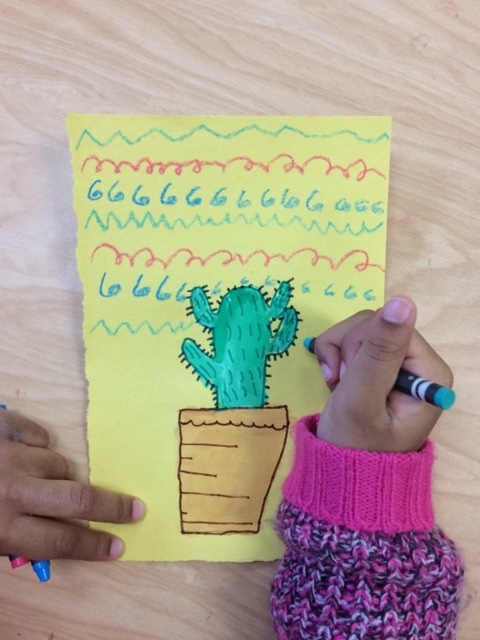 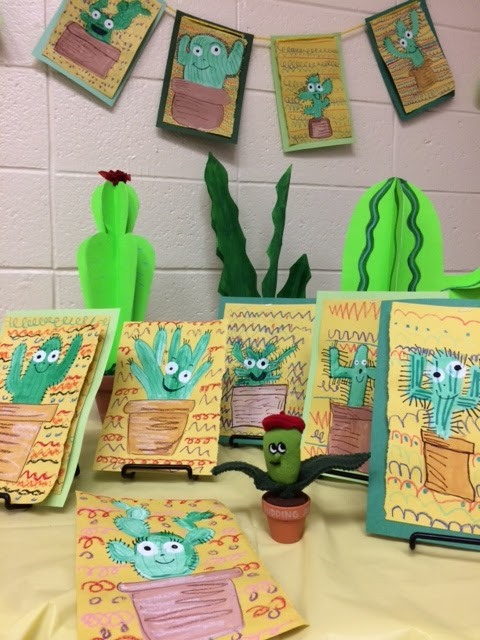 we used a marker to add details to the cactus and construction paper crayons to create a pattern in the background. 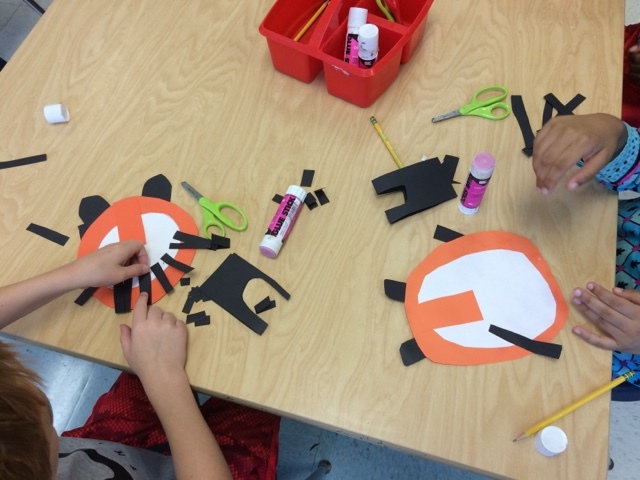 Finally, we added a face. 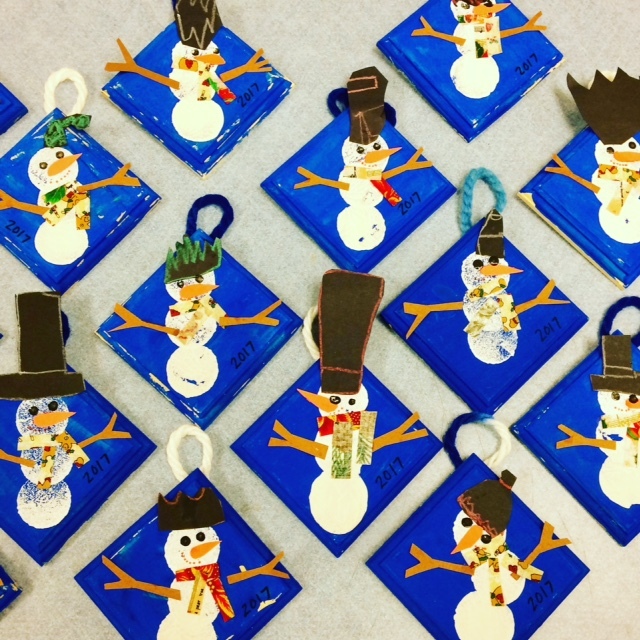 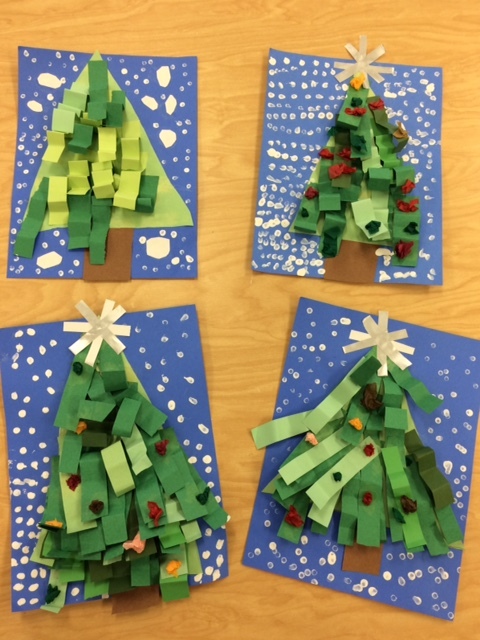 We had a very creative and crafty 2017 holiday season at Young School! 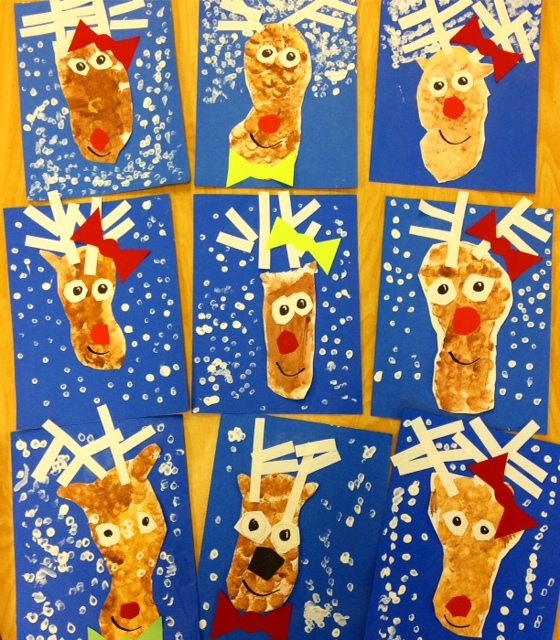 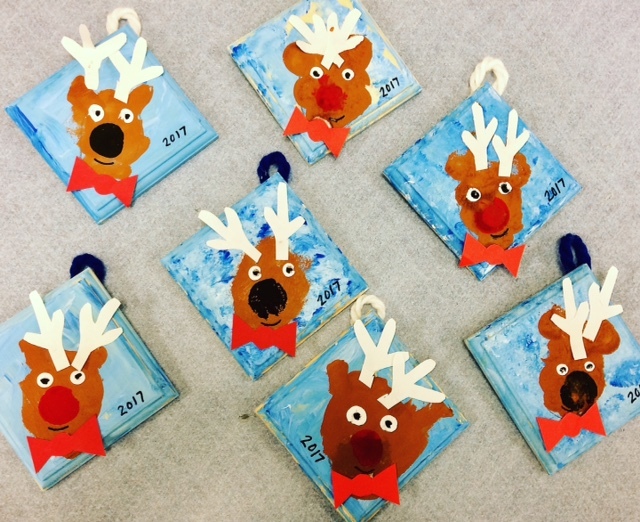 We traced our feet to create these cute reindeer paintings. 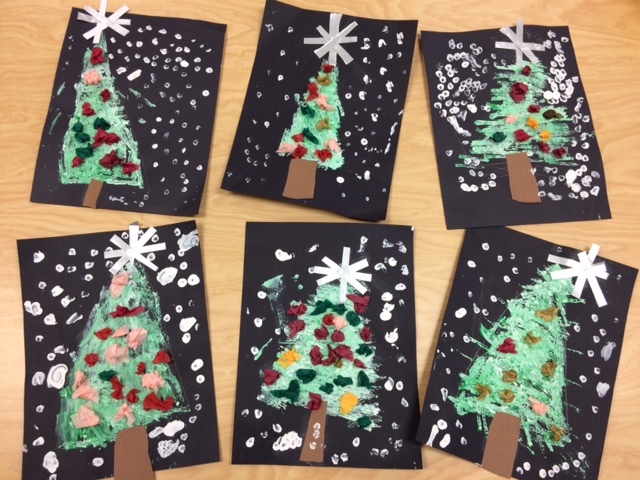 We loved adding snow with Qtips. 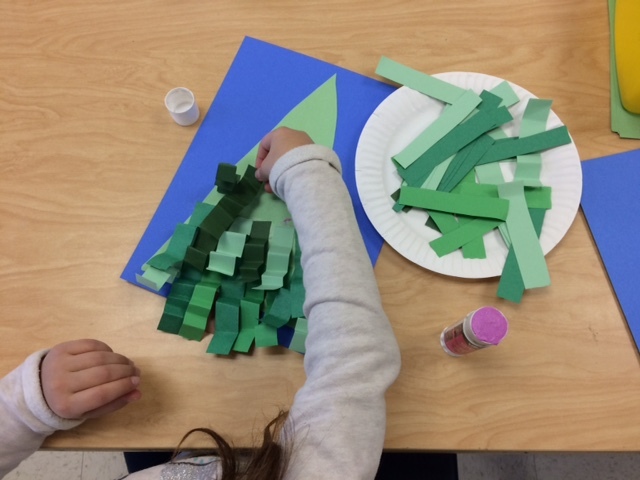 We folded green paper strips to create beautiful holiday trees. 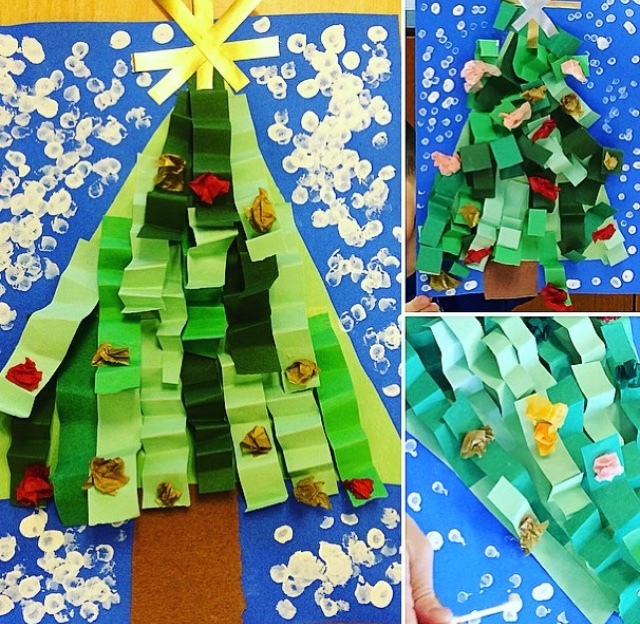 We love all of the overlapping texture! 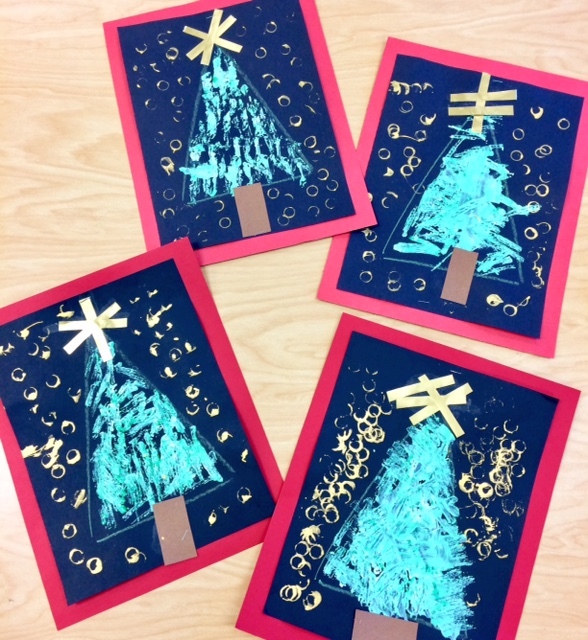 We used a piece of cardboard to stamp our trees. 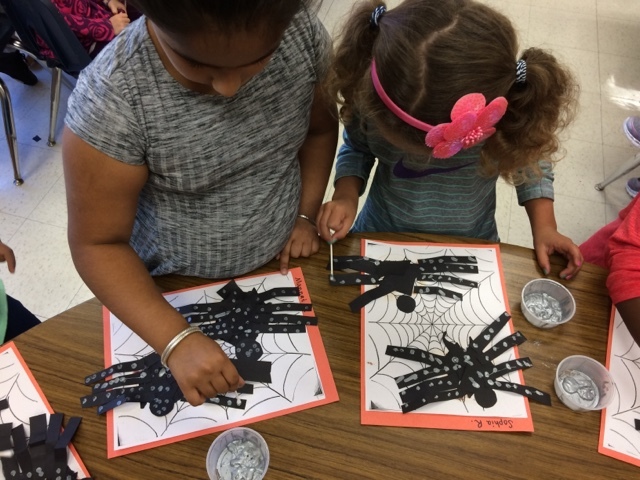 We printed with marker caps to create stars. 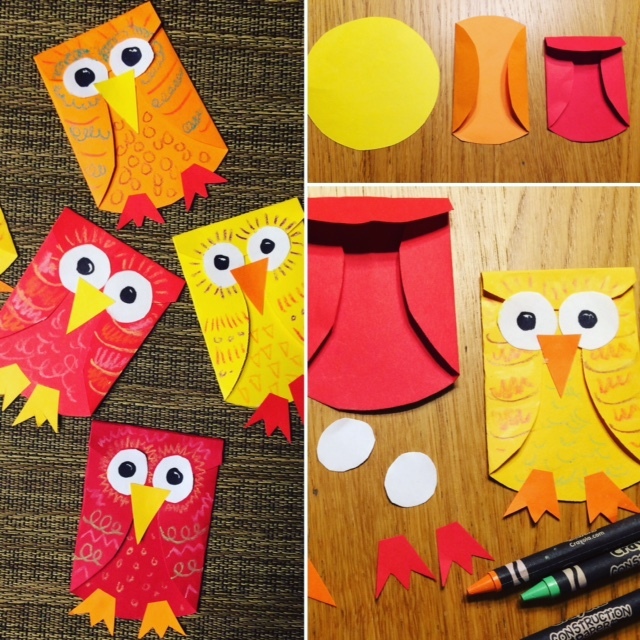 Fold a circle to create a fun owl ornament. 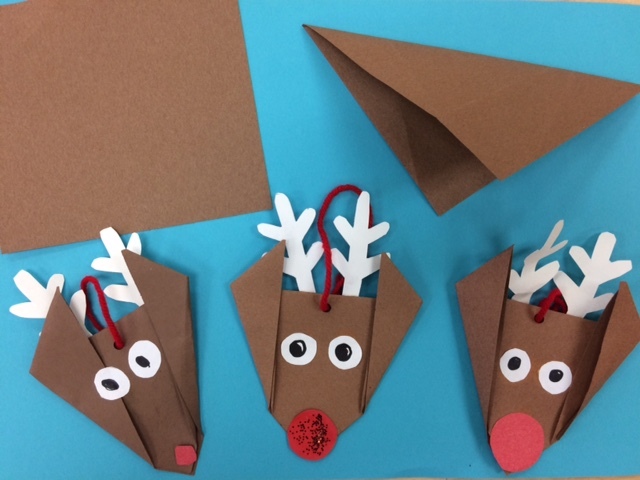 Fold a triangle to create a fun reindeer ornament. 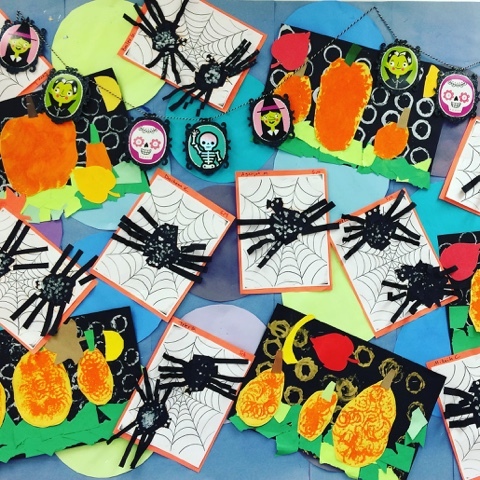 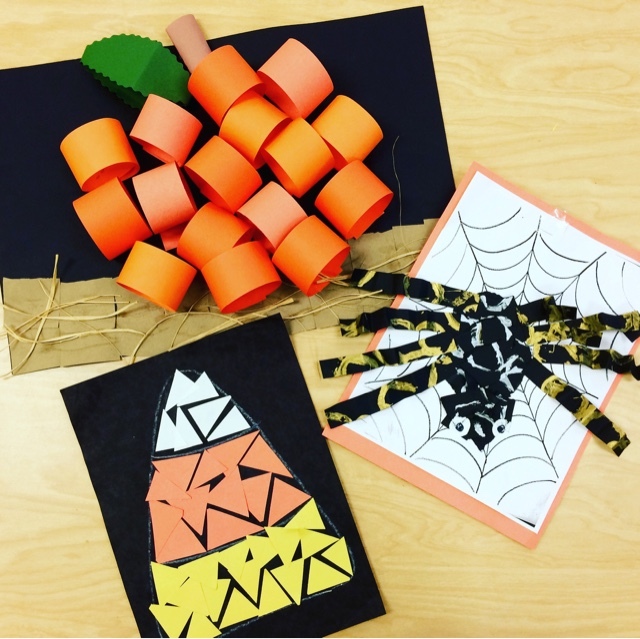 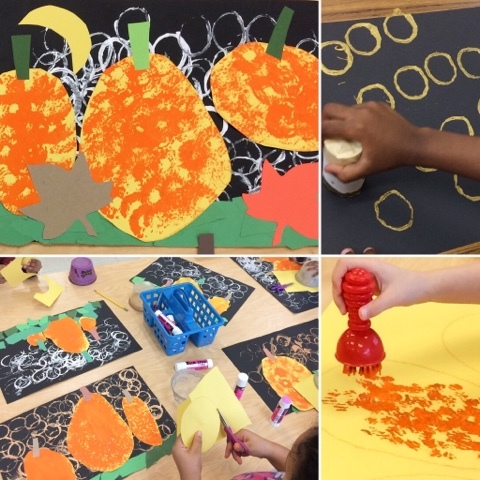 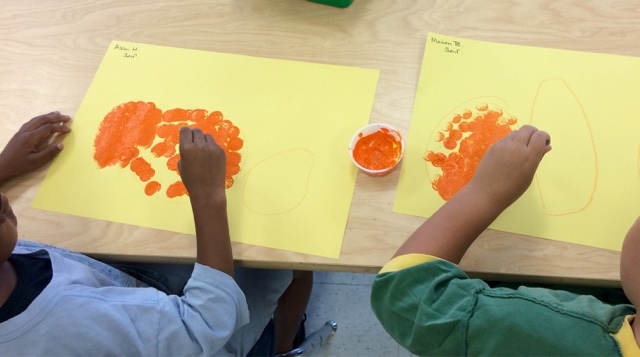 We're celebrating all things AUTUMN in the Art room! 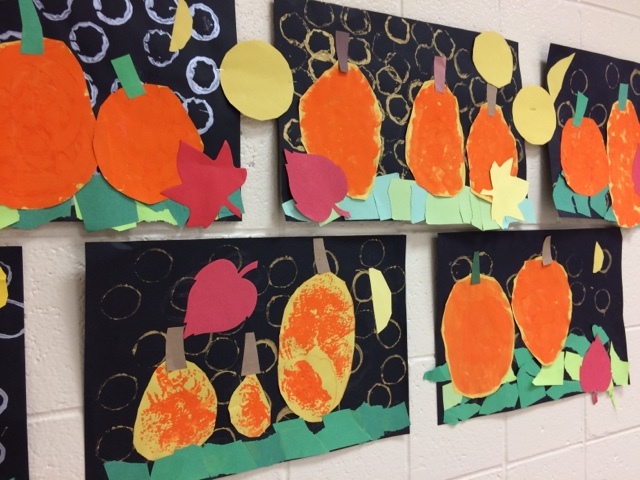 Kindergarten and Small Group PreK loved making a fun texture pumpkin patch. We painted and printed with sponge brushes, texture tools, and paper tubes. 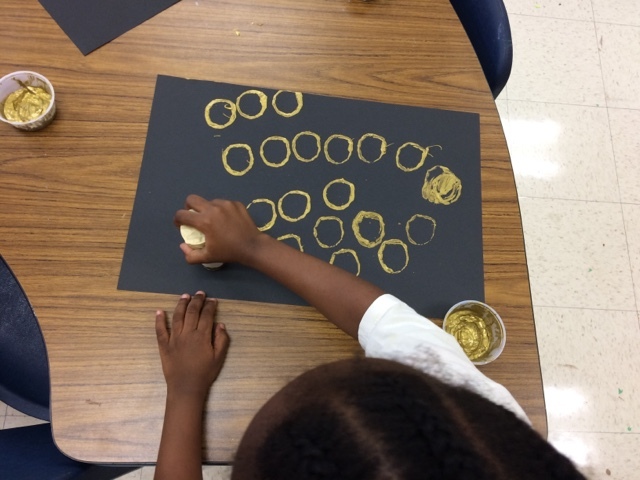 This gold metallic paint was a big hit! 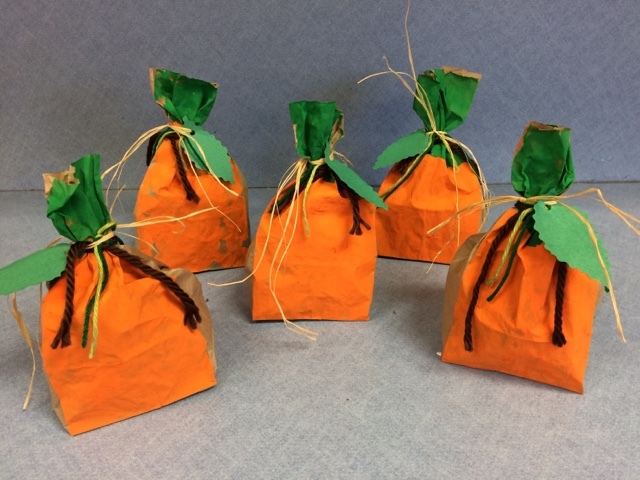 Small Group PreK created paper bag pumpkins. 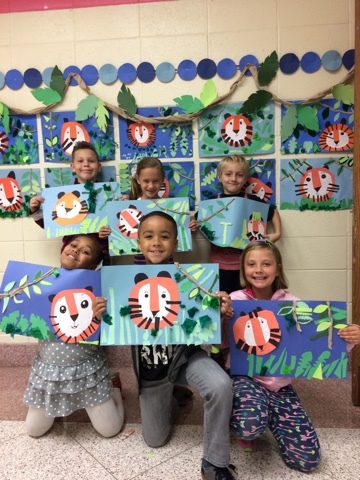 We're WILD about ART in 2nd Grade! 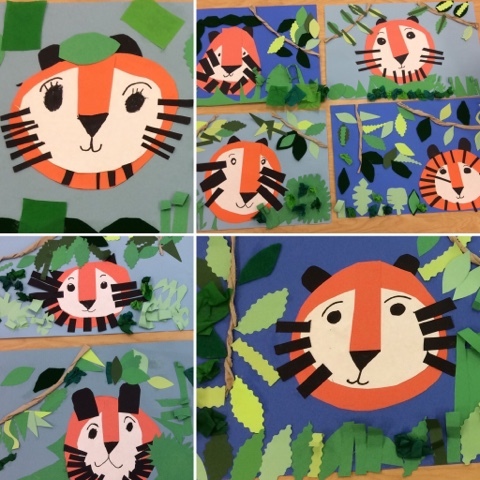 Our tiger collages are terrific! 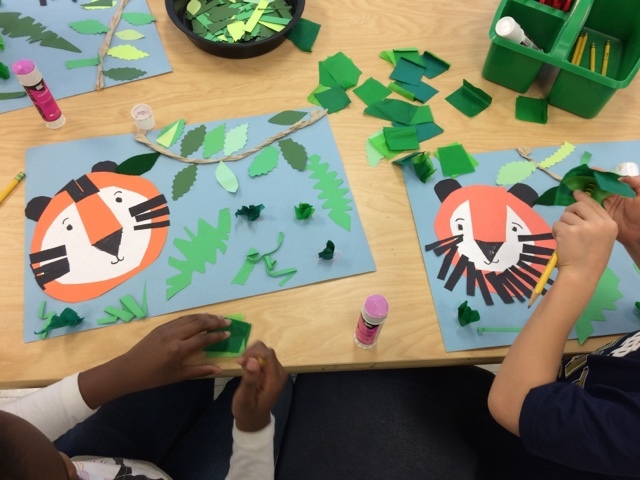 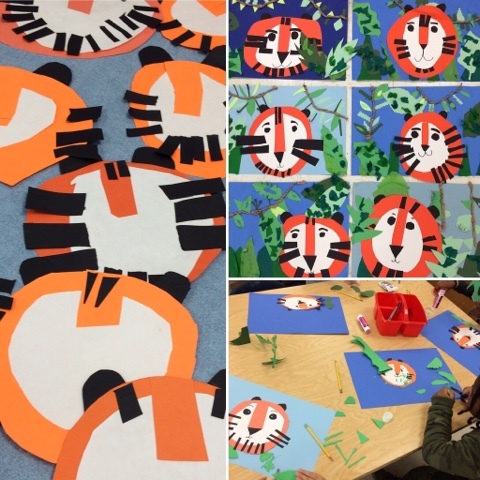 We've been very busy cutting and gluing to create a tiger in the jungle. 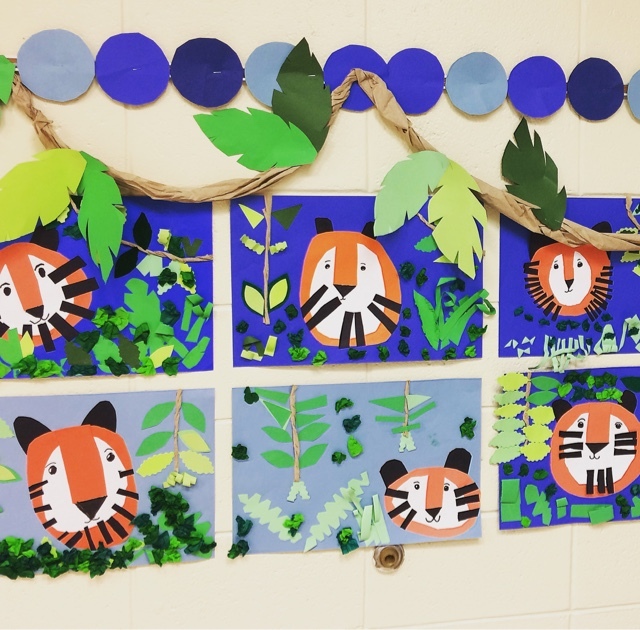 I love that each tiger is unique. 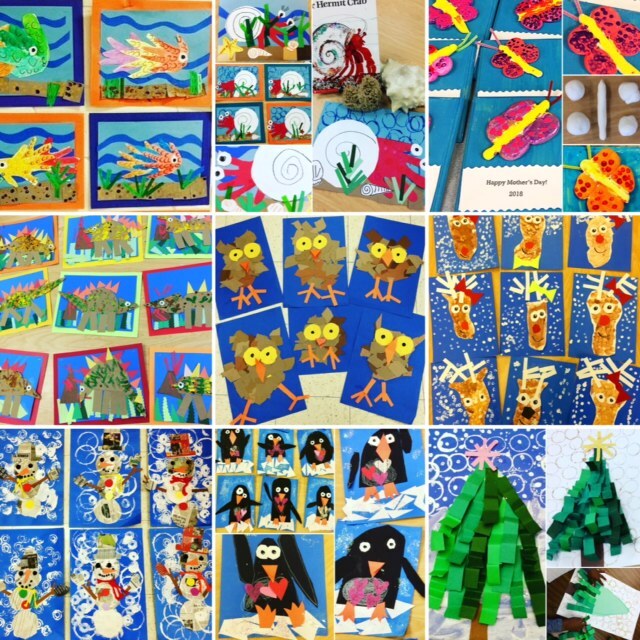 We're very proud of our work!